Hover your mouse to pause scrolling. 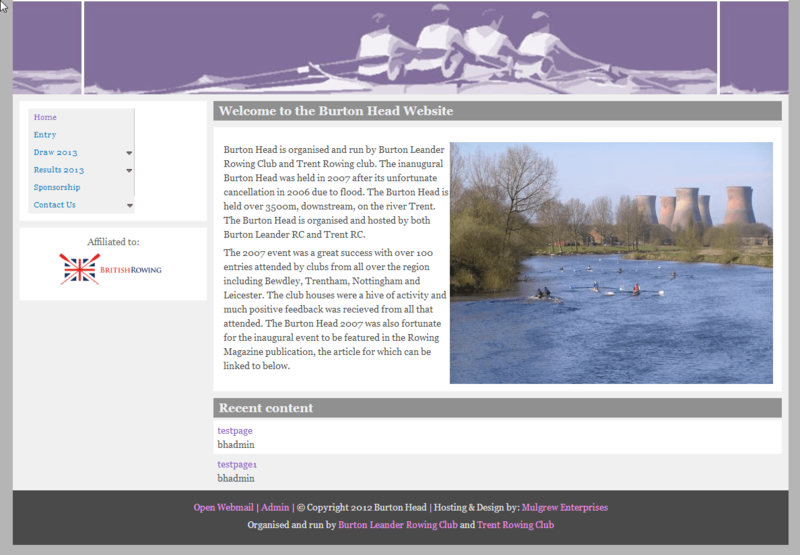 Burton Head is a website designed for a local rowing association. They facilitate a jointly run event between Trent Rowing Club and Burton Leander Rowing Club. The site contains several static page and the client can add pages themselves. The site had a slideshow on the homepage heading. 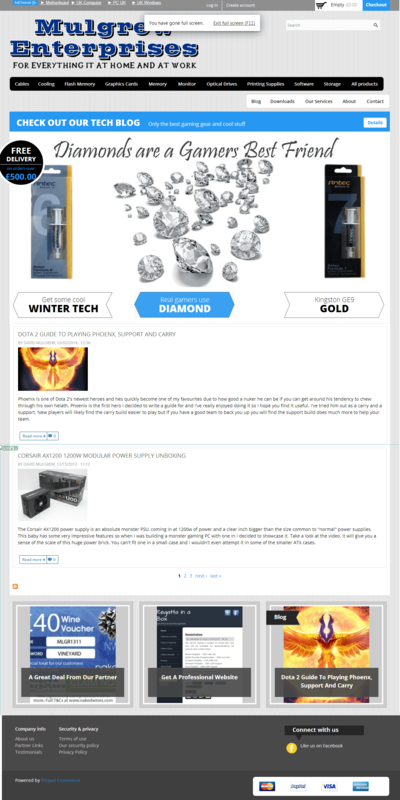 The homepage is dynamically generated form a combination of blog posts and a selection of recent products. The sites admin editor has several SEO reporting tools built in to assist in checking that SEO is applied correctly. The site automatically submits new pages and products to search engines in order to ensure pages are found quickly. 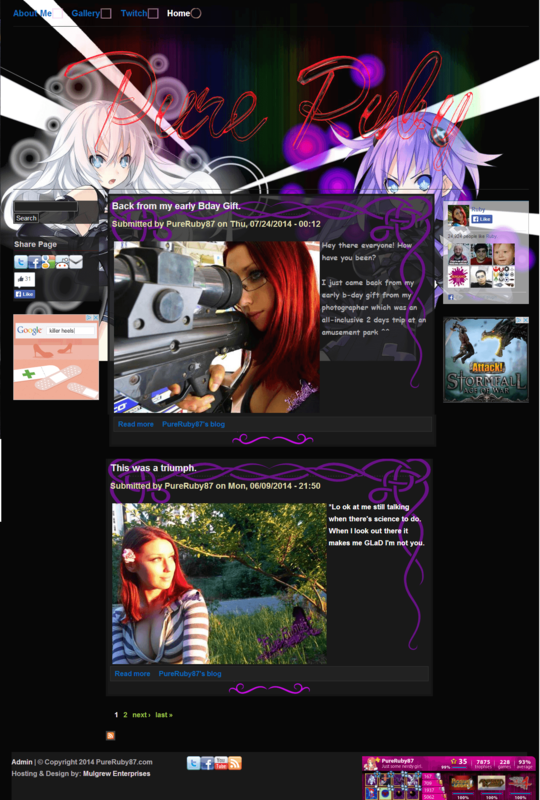 PureRuby's website contains 3 static pages, an About me page, a gallery and a Twitch feed. It also contains a dynamic home page for blog entries. Any images on the site are automatically watermarked and scaled to appropriate sizes. Social media integration is very important. Articles have a facebook comments box. Links to social media sites are included. A facebook likes box is included and a "share this page" button on every page. The site contains 2 sidebar google adwords adds on every page and a horizontal banner on some pages. The site contains overlapping background images with transparency and allows these to be changed. 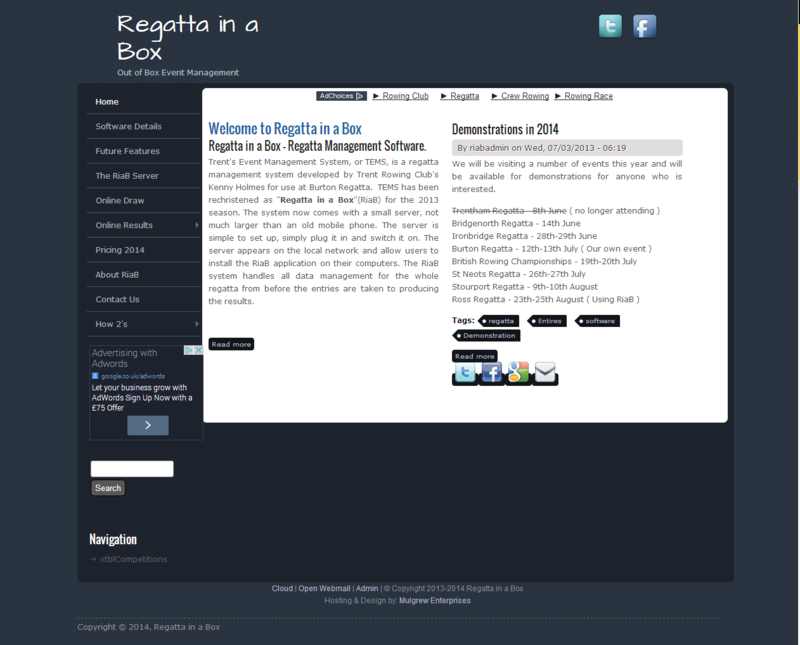 Regatta in a box is an events management company. The website is to both demo the product and provide online services for the events system. This site contains a dynamically built set of tables. Events record results to a database and the website uses the database to build the results tables. This facilitates event results to appear live on the webpage. The site also includes Google adsense adverts which appear with the tables too. Most pages also have a Facebook comments box at the bottom of each page. The client provided us with some material documenting the community centres history. We produced almost all of the photos and created the artwork using images of the centre and their signage as a base. 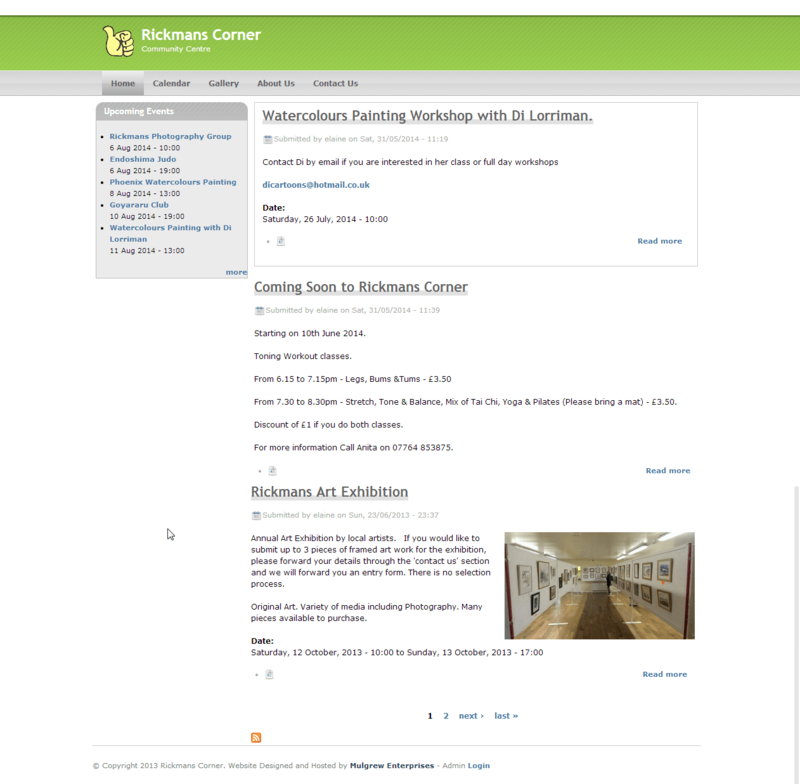 Rickmans Corner's 's website contains 5 pages on the navigation bar as well as events and news articles. The hompage – This contains a news feed with recent events, relevant news and details of upcoming events, as well as an agenda summarised form the calendar. The contacts page sends emails to the client whenever a customer fills in the form. It is protected by a CAPTCHA to prevent spam. It contains a Google map and a partners links section. Some basic SEO was included in the design. We wrote all of the text content allowing for SEO. The about us page contains images and the Centre's history. The site contains a calendar of events, These can optionally be displayed on the home page. The Client can add events themselves in a very simple format. The gallery page can also be edited by the client in a very simple format and also links to a slideshow of all the images on the page. 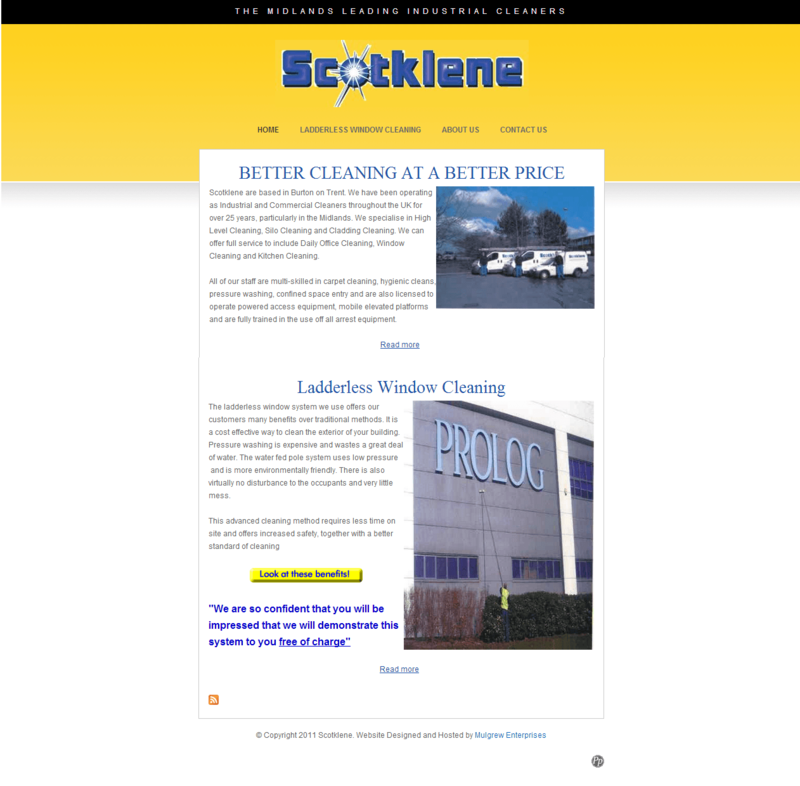 Scotklene is a family run industrial cleaners based in Swadlincote. The website serves to demonstrate their services and provide online contacts. This client provided us with their existing promotional material so we could match the branding on their existing material. A link to an articel "Better cleaning at a better price"
The contacts page is a simple design sending messages via email. Some SEO was included in the design to help the site be found by customers searching for cleaners. The text content was provided by the customer. We changed some of the wording to be more SEO frinedly. 2 days after the site went live we recieved a call form the client to advise us the website had already generated new business. Stan's Pals is a friendly pet sitting and dog walking service. They initially required a site to share information with customers which was then later expanded into an online shop. This client had no branding at the time of going live with the existing website but did have a member of staff working on the site with us. The website features a blog, social media integration and an online shop.